Belmont student Nathan Fink runs a Maui Wowi stand at Belmont University in Nashville, Tenn. June 6, 2017. 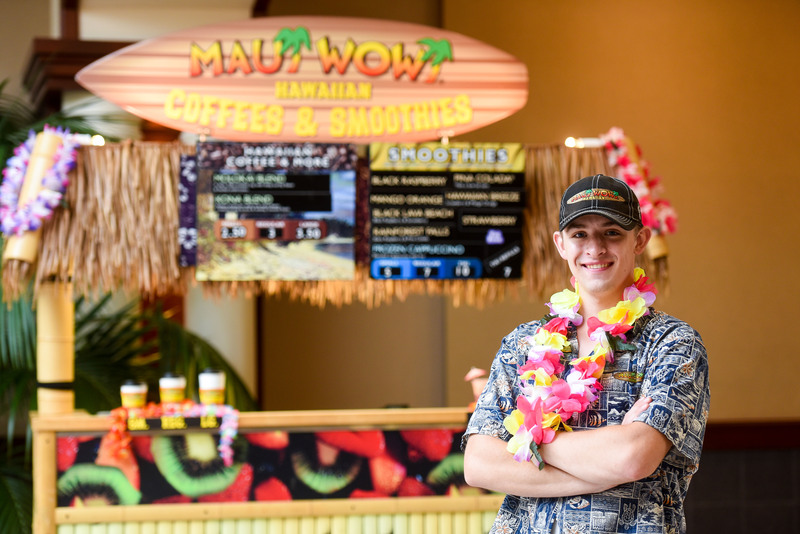 Belmont sophomore, economics major and local entrepreneur Nathan Fink was recently featured in U.S. News and World Report’s article, “Discover Creative Ways to Afford College,” for his franchise of Maui Wowi Hawaiian Coffees and Smoothies. As a franchisee, Fink opens his food cart at basketball games held in Belmont’s Curb Event Center Arena. The profits from his entrepreneurial venture assist in his expenses. “There’s the potential to make $1,000 in a weekend,” Fink said in the article. His dad bought into the franchise in 2013, operating a few carts in Fink’s hometown of Mayville, Wisconsin. “I was watching him do it, and I was helping out at events and making smoothies. I made use of that experience to get started on my own,” he went on to say. After finding a retired owner in Nashville, Fink took over the franchise to sell on Belmont’s campus, as well as local high school sporting events and tournaments. Fink went on to mention the addition benefits of operating the cart, including the flexibility of hours and the ability to keep up with his school work. To read the article in its entirety, click here.